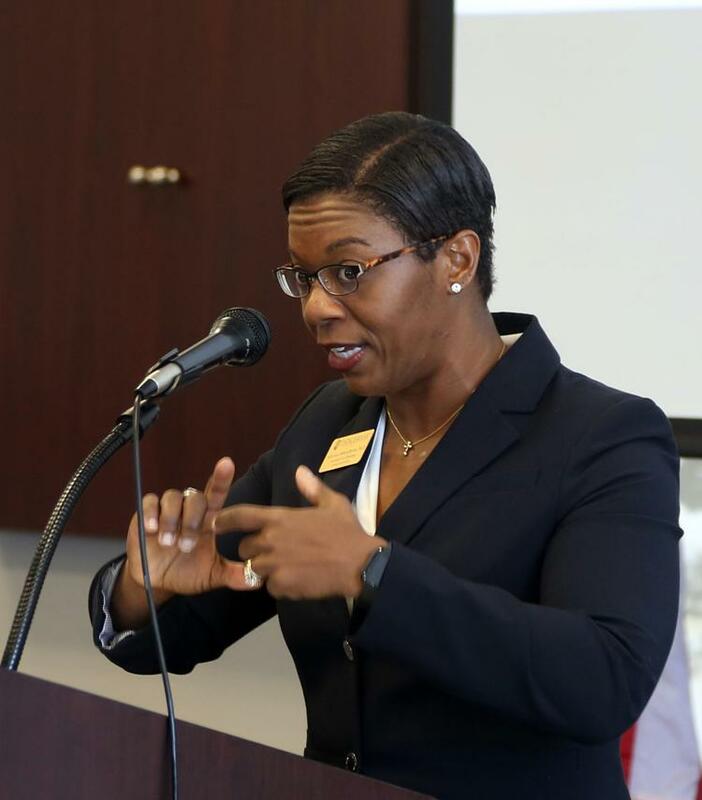 Dr. Atiya Stokes-Brown provided the keynote address at the Greater Florence Chamber of Commerce’s Building Bridges Diversity and Leadership Summit. Stokes-Brown’s speech focused on developing a diverse and inclusive workforce. A portion of her talk also was about avoiding implicit biases. Implicit biases, according to Stanford University, are relatively unconscious judgments and relatively automatic judgments of social behaviors. In response to a question, Stokes-Brown talked about the need to explore implicit biases on an age-appropriate level with children so that the implicit biases do not become an ingrained habit. Stokes-Brown is the assistant vice president for diversity and inclusion at Coastal Carolina University at Conway. She joined the Coastal Carolina faculty after a 10-year career at Bucknell University, a liberal arts college in Lewisburg, Pennsylvania, where she served in the department of political science, as an assistant dean in the college of arts and sciences, and as an interim associate provost for diversity and inclusion. She is a graduate of Randolph-Macon Women’s College, Temple University, and the University of Maryland-College Park. Other panelists and speakers at the event included Florence City Councilwoman Teresa Myers Ervin, Greater Florence Chamber of Commerce Director of Community and Minority Enterprise Les Echols, Dr. Louis Venters from Francis Marion University, Toyinda Smith of Leadership Strategy and Consulting, Luncida Fountain of Honda of South Carolina, Starlee Alexander of State Farm, Pamela Elliott of McLeod Health, Twana McRae of the South Carolina Federal Credit Union, Dr. Erica James of Francis Marion University, and Dr. Marc David of Florence-Darlington Technical College. The mission of the Building Bridges Summit is to enable the community address issues of diversity by a process of changing attitudes through education. To read the full article on SC Now, click here.